This week my youngest daughter had a very physical gravity lesson. 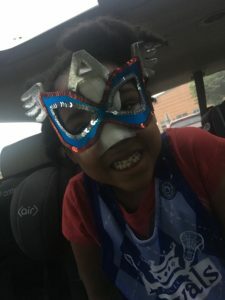 In not listening to her father, she fell off a concrete step and banged up her nose so bad that one nostril is swollen…she is scraped up and bruised and mad at herself and at gravity. This is the same child that pushes boundaries, exercises her “leadership qualities” whenever she can…and is fearless in her pursuits. Her moxie is inspiring but can lead to sometimes hazards situations. Yet, she never shies away from dusting herself off and trying again. “You can’t fight gravity” I tell her. “But how will I learn to fly?” she responds. Sometimes we have to take risks in leading. Step out on a ledge and pray we are able to fly, knowing that the concrete below us may be hard and will hurt. The great risk can equal great reward or just a great lesson in what not to do next time. Both results are critical to our personal and professional growth. How do you use gravity to your benefit? Is it an anchor holding you back from making a hard decision? Or do you use it as a stepping stone to greatness? Have you built the wings you need to soar? As a leader, we can gnaw on a decision at length. We fight the appearance of ‘decision paralysis,’ while acknowledging we need to take the time to review facts and make decisions that are aligned with our personal leadership styles and the organizations we are a part of. Yet, even with all of the facts and figures and battle scars and “nose scrapes” from failed processes and people that we bet on that did not work out – a lot of our decision making comes from educated ‘guts.’ Having the moxie to learn to fly and soar knowing that failure will hurt but not as much as not trying. In my future, I am going to look back on the conversation I had with this fearless young leader and think to myself how I can learn to fly. How I can make better trusting the data and my gut…knowing that it may not always work the way I thought – as a matter of fact, it may be even better than I imagined. So step out and be the hero you were meant to be and soar.